Andrew Sullivan posted the following chart, which he found in National Geographic, and he noted, with considerable justification, that this was evidence of an insane and inefficient healthcare system in America. The chart shows that America spends a lot more than other nations without a concomitant increase in life expectancy. Let’s set aside whether the right side of the chart is a bit misleading because American life-expectancy numbers are influenced by things that have nothing to do with the quality of the healthcare system, such as highway fatalities, homicides, and obesity, and focus on Andrew’s claim that Obama’s proposal will make things better because of its “cost-control measures.” Since the Administration’s own experts have predicted that Obama’s proposal will increase total healthcare spending, one can only wonder what he’s talking about. Does he actually think a new government entitlement program will lead to lower costs, when all the evidence suggests otherwise? If he really wanted a chart that captures what’s wrong with America’s healthcare system, he should have gone to the Centers for Medicare and Medicaid Services’ national health expenditures data website and downloaded the figures showing how rampant third-party payment has resulted in consumers directly paying for less than 12 percent of healthcare costs. And when people are purchasing something with (what is perceived to be) other people’s money, it’s understandable that they don’t pay much attention to cost. My homemade chart does not compared to the one produced by National Geographic, but it does identify the real problem. 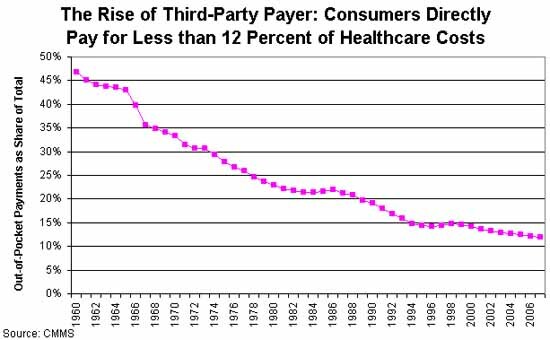 Sadly, Obama’s plan (like Bush’s Medicare expansion, and everything else politicians have done for the past 50 years) will exacerbate the third-party payment problem and lead to even higher costs and more inefficiency.